It took a long time, but it’s 2019, and we’re starting to get used to the concept of talking to a computer to make it control things around the house. It’s not quite as cool as it seemed when we saw it in films way back when, but that’s just real life. The problem is, there’s a multitude of different systems and standards and they don’t all necessarily work together. In [Blake]’s case, the problem is that Woods brand hardware only works with Amazon Alexa, which simply won’t do. [Blake] went through the hassle of getting an Amazon Alexa compatible WiFi outlet to work with Google Assistant. It’s a bit of a roundabout way of doing things, but it works. A TP-Link HS-105 WiFi plug is used, which can be controlled through Google Assistant voice commands. The part consists of two PCBs – a control board that speaks WiFi, and a switching board with relays. [Blake] used the control board and hooked it up to a Raspberry Pi. When switched on by a command from Google, the HS-105 sets a pin high, which is detected by the Raspberry Pi. The Raspberry Pi then runs a software implementation of the KAB protocol used by the Woods hardware, triggering it when it receives the signal from the TP-Link hardware. If we understand correctly, [Blake] had to go to this trouble in order to make his special outdoor-rated outlets work with his Google Home setup. Hopefully interoperability improves in years to come, but we won’t hold our breath. We’ve seen some pretty convoluted projects in this space before, often using IFTTT — like this ESP8266 voice controlled tank. Here’s a Big Mouth Billy Bass with extra lip thanks to Alexa. If you’re not already familiar, Big Mouth Billy Bass is the shockingly popular singing animatronic fish designed to look like a trophy fish mounted to hang on your wall. In its stock condition, Billy uses a motion sensor to break into song whenever someone walks by. It’s limited to a few songs, unless you like to hack things — in which case it’s a bunch of usable parts wrapped in a humorous fish! Hackaday’s own [Bob Baddeley] combined the fish with an Amazon Echo Dot, connecting the two with an ATtiny84, and having Billy speak for Alexa. [Bob] had a few problems to solve, including making Billy’s mouth move when there was audio playing, detecting when the Echo was on, moving the motors and playing the audio. After a bit of research and a lot of tweaking, a Fast Fourier Transform algorithm designed for the ATtiny was used was used to get the mouth moving. The mouth didn’t move a lot because of the design of the fish, and [Bob] modified it a bit, but there was only so much he could do. It’s all well and good for the fish to lie there and sing, but [Bob] wanted Billy to move when Alexa was listening, and in order the detect this, the best bet was to watch for the Dot’s light to turn on. He tried a couple of things but decided that the simplest method was probably the best and ended up just taping a photo-resistor over the LED. Now Billy turns to look at you when you ask Alexa a question. With a few modifications to the Dot’s enclosure, everything now fits inside the original mounting plaque and, after some holes were drilled so the Dot could hear, working. Billy has gone from just a few songs to an enormous entire library of songs to sing! We’ve seen Alexa combined with Big Mouth Billy Bass before, but just demos and never an excellent guide like [Bob’s]. The nice thing about this guide is that once you’ve hacked the hardware, it’s a breeze to add new functionality using Alexa skills. Sometimes a gadget like Alexa or Google Home is a solution looking for a problem. Then the problem you’ve been looking for hits you square in the face. I’ve confessed before that I have an oscilloscope problem. I also have a microcontroller development board habit. It appears now I have too many 3D printers. I recently finished building my latest one, an Anet A8 I picked up on Black Friday. While calibrating it, I found myself juggling a screwdriver, a pair of pliers, and trying to operate the thing all at one time. I realized I had to come up with a better way. I don’t know if it qualifies as an addiction yet, but I also have an Alexa in every room (although I call it “Computer” because I’m a Star Trek fan) and a Google Home device almost everywhere. Why can’t I get one of these assistants to operate my printer for me? What are assistants for, after all, other than telling Dad jokes? You’d think adding voice control to a 3D printer would a bit difficult. With the right tools, it is actually pretty easy. Luckily those tools aren’t anything special… if you want a set up like mine, where Alexa controls your 3D printer, read on. [Zach Levine] wrote in to share a project just completed: a classic Furby packing a Raspberry Pi running Alexa: he calls it Furlexa. The original Furby product wowed consumers of the 90s. In addition to animatronic movements, it also packed simulated voice learning technology that seemed to allow the Furby to learn to speak. It wasn’t like anything else on the market, and even got the toy banned from NSA’s facilities in case it could spy on them. Elegantly, the robot uses only one motor to move all of its parts, using a variety of plastic gears, levers, and cams to control all of the robot’s body parts and to make it dance. Over the past twenty years the Furby has earned the reputation as one of the most hackable toys ever — despite its mystery microcontroller, which was sealed in plastic to keep the manufacturer’s IP secret. [Zach] replaced the control board with a Pi Zero. He also replaced the crappy mic and pizeo speaker that came with toy with a Pimoroni Speaker pHat and a better mic. So, your smart mirror has been running for a while, but Halloween is coming up and you want to come up with some cool Halloween stuff to display on the mirror. If you’re looking for ideas, check out [Ben Eagan]’s cool Haunted Smart Mirror which connects the mirror via a Raspberry Pi with Amazon Alexa and Phillips Hue lighting. [Ben] points to another of his blog pages for those readers interested in the nuances of setting up Alexa with a smart mirror, while concentrating on communication with the Hue bridge and creating the setup for a new Alexa command in this post. Dealing with the Phillips Hue API seems fairly straightforward: Get the IP address of your Hue bridge from your router and the ID of your lights from the Hue app and you’re set to send commands via HTTP. [Ben] includes a Python script to make the lights flicker, which you can modify for your own lights as you wish. 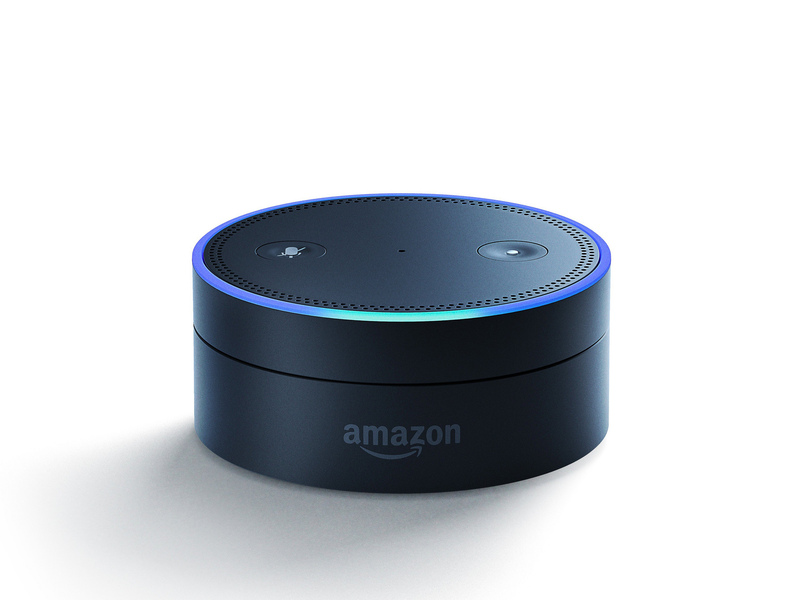 Once that’s done, you’ll need to set up the intent that Alexa listens for, and then modify the AWS lambda function that sends commands to the Pi. When the command shows up in the queue on the Pi, any commands [Ben] wants to play are fired off – in this case, a video is played and the Hue lights start to flicker. There’s no mention of security in the article, so that may be worth a little attention with Alexa and the Hue, but with Halloween coming up fast even if you haven’t built a magic mirror yet, if you’ve got Hue lights, this would be a great, quick, Halloween idea. Especially if you could combine it with your outside lights so that Trick-or-Treaters can join in on the fun. Maybe you’d prefer looking up passing planes using Alexa? Or how about getting your fish to talk? If you are looking around for a Halloween project, you might consider The Yorick Project from [ViennaMike]. As you can see in the video below, it marries a Raspberry Pi acting as an Amazon Alexa with an animatronic skull. This isn’t the most technically demanding project, but it has a lot of potential for further hacking. The project includes a USB microphone, a servo controller, and an audio servo driver board. It looks like the audio servo board is controlling the jaw movement and based on the video, we wondered if you might do better running it completely in software.